HARRISBURG, Pa.—TE Connectivity (TE), the developer of connectivity products and sensors, has introduced its ELCON Micro power connectors, reported to deliver high current density in a commonly used industry footprint of 3.0mm. 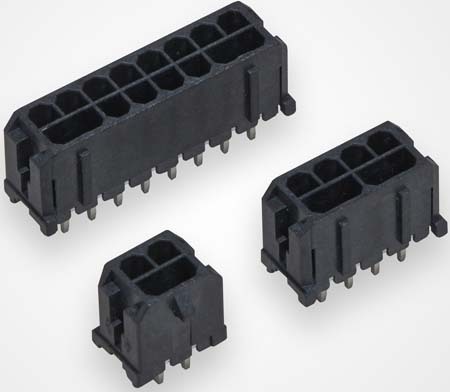 The new connectors provide 12.5A per pin, making them useful for servers, switches, storage devices, and testing machines, TE said in a press release. TE’s Elcon Micro power connectors use a common industry footprint to allow for easy upgrades to existing designs. The 3.0mm printed circuit board (PCB) footprint is compatible with Molex’s Micro-Fit headers and BellWether’s Micro-Hi headers. The new connectors support 2- to 24-pin configurations and are said to perform reliably in harsh environments due to their maximum operating temperature of 105 degrees Celsius and their halogen-free material. The connector housing is designed to prevent mis-mating, making assembly easier for customers, the company said. ELCON, TE, and TE Connectivity are trademarks of TE Connectivity Ltd. family of companies.